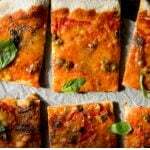 Anchovy pizza with capers also known as Pizza Napoli is a classic and simple pizza topping packed with so much flavour. Made with an easy basic pizza dough it's a great classic for pizza night! Add the yeast to the lukewarm water and set aside for 5 minutes. Combine the flour and salt in a large mixing bowl. Make a well in the centre and add the water/yeast mixture whilst mixing the dough together with a spoon until you have obtained a dough. If it's too sticky you can gradually add a little more flour. Alternatively you can make my instant pizza dough. When you are ready to make the pizzas place your pizza trays in the oven and preheat the oven to 220°C/425F/gas mark 7. Remove the pizza tray from the oven and dust lightly with semolina flour. Transfer your dough to the tray and spread with 4 tbsp of passata, you don’t want to much or your pizza will go soggy. Sprinkle over the oregano then top with equal amounts of torn mozzarella, anchovies and capers. Bake in the oven for around 8-10 minutes until the cheese is melted and bubbling and the crust is golden. *you can also use type 00 flour or all-purpose flour. If you can find type 0 or 00 then look for flour that's recommended for making pizza. Makes 2 large tray pizzas approx 15.5 x 13 inches. Try my instant pizza dough recipe if you're pressed for time.